Extended Hours for Spring Break! 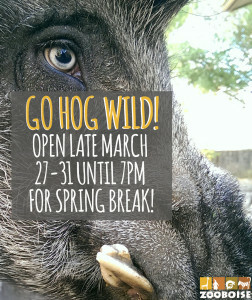 Go “Hog Wild” this Spring Break at Zoo Boise! We have extended our hours and will be open late until 7pm every day March 27-31! Bring the whole family to enjoy the early spring weather and help us finish our Zoo with a New View Capital Campaign. This campaign will allow us to build a new 2.5-acre exhibit, bring new guests amenities, replace out of date exhibits, and expand our wildlife conservation mission! Don’t forget the sunscreen, because the sun should be out and we expect the animals to be active. 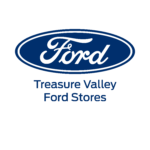 Learn more about the Zoo With a New View Capital Campaign. Purchase a commemorative tile or make a donation now by visiting www.zooboise.org/tile.